On January 24, 2018, Maine youth, ranging from elementary schoolers to college students, along with Maine voters, filed a petition today with the Maine Department of Environmental Protection (DEP). The petitioners are asking the state to do more to protect their futures. Specifically, they called on the DEP to make rules based on an existing 15-year-old law that states that Maine will reduce greenhouse gas emissions “sufficient to eliminate any dangerous threat to the climate.” Additionally, the DEP has public trust and constitutional obligations to protect Maine’s essential natural resources for generations to come. 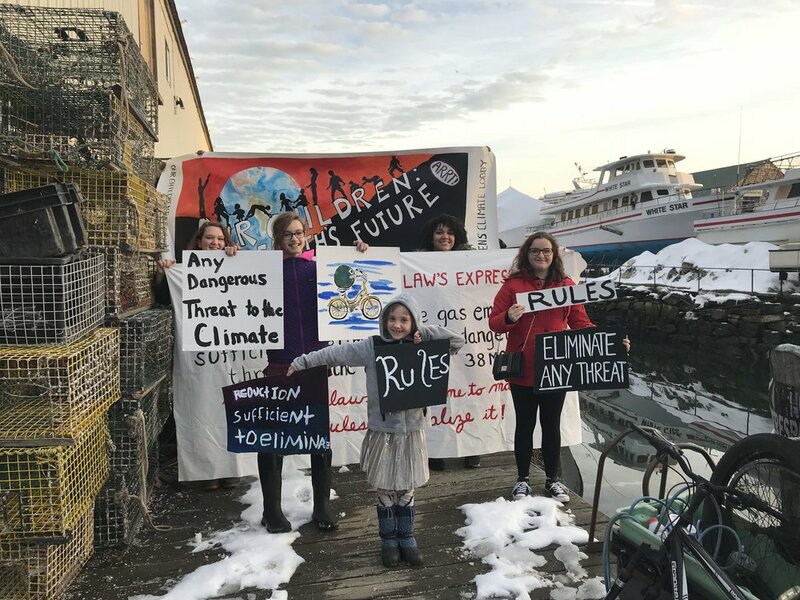 A group of Mainers, including youth, are preparing to file a revised petition for rulemaking to the Maine Department of Environmental Protection (“DEP”). The petition asks that the DEP fulfill its constitutional, public trust, and statutory obligations to implement science-based greenhouse gas emission reductions necessary to avoid the worst impacts of climate change and ocean acidification and protect a stable climate system for present and future generations. In light of the extreme weather events, ocean acidification, record-setting temperatures, and other climate impacts already being experienced, there is no time for Maine to delay. Our Children’s Trust is supporting our partners in Maine, including 350Maine and Citizens Climate Lobby, in collecting signatures for the Maine petition. Under Maine law, when 150 or more registered voters submit a petition for rulemaking to a state agency, the agency must initiate rulemaking proceedings. We are hoping to collect far more than 150 signatures from registered voters and are also collecting youth (under 18) signatures. If you are a Maine registered voter and are interested in adding your name to the petition for rulemaking, please contact Angus Ferguson (angus@angusferguson.com) for information on how to sign up (registered voters must sign up on paper and cannot sign online). Maine youth (and those not registered to vote in Maine) who want to sign onto the petition for rulemaking can do so here. The petition for rulemaking is available here. In a one page letter, the Maine Department of Environmental Protection denied the climate change petition for rulemaking filed by 164 youth and 216 registered voters. The letter lacks any analysis of the merits of the petition for rulemaking and fails to explain how Maine is adequately addressing climate change. The denial letter simply states: “Much of the language provided either exceeds what is appropriate for rulemaking, exceeds the Department’s authority, or is insufficiently specific to constitute an enforceable rule.” While we disagree, Our Children’s Trust is now working with lawyers and community members in Maine to file a revised petition for rulemaking. A group of Mainers submitted a climate change petition for rulemaking to the Department of Environmental Protection and the Maine Board of Environmental Protection. The petitioners – 216 registered voters, 164 young people, and the organizations 350 Maine and Earth Guardians – are requesting that the state carry out it’s constitutional and public trust obligations and implement an effective CO2 and GHG reduction strategy based on the best climate science. Failure to implement such a strategy, petitioners claim, would be detrimental for their survival. The Department of Environmental Protection denied OCT’s petition for rulemaking. A petition for rulemaking was filed with the Maine Department of Environmental Protection on behalf of youth.